Istanbul = formally Constantinople..... always admired the Orthadox Christian Church's architecture. I've always loved that Milwaukee church. The rotunda style was one of the earliest styles used in church architecture (after the classic three aisle basilica). By the way LeCom, I'm also Eastern Orthodox. No need for a church to blend. A church should stand out. Old St. Nicholas contrasted very nicely with the World Trade Center. St. Nicholas Greek Orthodox Church was set to mark its 90th year Wednesday with its structure gone but its spirit intact. The landmark church in Manhattan's financial district was destroyed in the terrorist attacks of Sept. 11, 2001. The congregation and city authorities are still cementing a plan to rebuild. Members plan to mark the anniversary -- and the day devoted to the church's namesake saint -- by creating a "temporary church" at one of ground zero's gates. Given the church's history, it also will be an occasion to remember the terrorist attacks. Some victims' relatives were expected at the service, and visitors were invited to view artifacts recovered from ground zero. Built in 1916, the tiny church stood at the southern edge of what is now ground zero. It was traditionally a refuge for Greek sailors who believed that St. Nicholas, the patron saint of sailors, would keep their ships from sinking. St. Nicholas -- commonly known as Santa Claus -- was born in the third century to a wealthy family in Patara, a village in what is now Turkey. He became a bishop and lavished his inheritance on the needy, especially children. The church has served generations of Greek-American families and some of the world's rich and famous, including shipping magnate Aristotle Onassis and actor Telly Savalas. 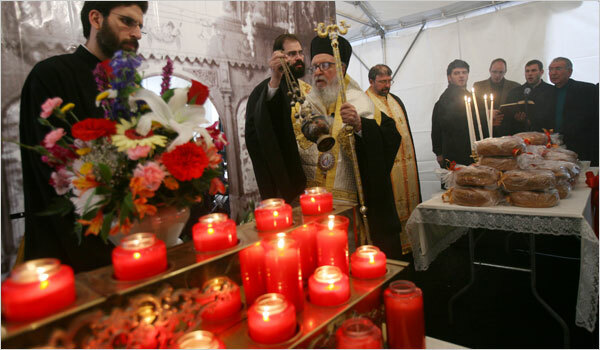 The Orthodox community worldwide has pledged millions of dollars to rebuild the church, which New York Gov. George Pataki promised would rise on or close to the same spot. The congregation's 80 families have worshipped elsewhere while awaiting the rebuilding. I was upset to hear that the church was crushed because im Greek. It never stood a chance when the towers fell. NEW YORK -- A church rose up for a day inside a white tent at ground zero. Hundreds of faithful from the tiny St. Nicholas Greek Orthodox Church, which was destroyed along with the World Trade Center, gathered in a makeshift canvas sanctuary on Wednesday, where they marked St. Nicholas Day and the 90th anniversary of their parish. "We have constructed a church for a day," said Peter Drakoulias, a church board member, before the afternoon service that drew worshippers from Boston, New York, New Jersey and Connecticut. As part of the ceremony, Archbishop Demetrios, the head of the Greek Orthodox Church in America, read the names of some Greek-Americans who died in the 2001 terror attacks. Among them was John K. Katsimatides, an employee of the Cantor Fitzgerald bond brokerage. "Once a week, my brother used to stop by this church, light a candle and pray," said his sister, Anthoula Katsimatides. The Sept. 11 attack decimated the landmark church that was once a refuge for everyone from Wall Street traders on their lunch break to Greek sailors who believed St. Nicholas, their patron saint, would keep their ships from sinking. The church, with barely enough seating for 100 people, also drew some of the world's rich and famous, including shipping magnate Aristotle Onassis and "Kojak" actor Telly Savalas. Parishioners have raised more than $4 million to rebuild the house of worship at or near its original site, an area just south of the one-time trade center location. The Port Authority of New York and New Jersey, which owns the 16 acres of the World Trade Center site, has yet to approve a final plan for rebuilding St. Nicholas. "We're just a little church, a small piece of the reconstruction, and we're being patient," said Drakoulias. St. Nicholas Church before September 11. As expected, the Port Authority last week approved the land deal with St. Nicholas Greek Orthodox Church to allow the Port to use the church's Ground Zero land and build a vehicle security center below. The bi-state agency agreed to give the church $20 million ($10 million is supposed to come from JPMorgan Chase for its planned adjacent building, though we'll see if that tower ever happens), along with up to $40 million for infrastructure. The church will get a significantly larger lot than it had prior to September 11, 2001, at 8,100 square feet. The Port Authority and St. Nicholas Greek Orthodox Church have reached an agreement that will allow the 92-year-old church to be rebuilt near its former location at the World Trade Center site. The agreement also resolves a key issue - one of the 15 fundamental issues identified in last month's Port Authority World Trade Center Assessment -- that will allow construction to proceed on the Vehicle Security Center - a vital artery that will serve nearly every facility on the site and is a key driver of schedules and costs of the other projects. At its monthly meeting today, the bistate agency's Board of Commissioners authorized an agreement between the Port Authority, the Lower Manhattan Development Corporation, the City of New York and St. Nicholas Greek Orthodox Church that will move the site of the Greek Church to allow for access and construction needed for the construction of the Vehicle Security Center. Under the agreement, St. Nicholas Church agreed to convey property at 155 Cedar Street - where the church was located before it was destroyed on 9/11 - to the Lower Manhattan Development Corporation. LMDC, in turn, will transfer the parcel at 130 Liberty Street to the church for its new building. LMDC will then transfer property at 155 Cedar Street, 140 Liberty Street and a portion of 130 Liberty Street to the Port Authority for construction of the South Bathtub, which will house the Vehicle Security Center. St. Nicholas will receive up to $20 million in direct costs for the rebuilt church, including $10 million from the Port Authority to mitigate the impact on the cost of building the church over the Vehicle Security Center, and $10 million from a third party as part of a future development agreement for the Tower 5 site. The Port Authority will provide an additional $20 million, up to a maximum of $40 million, to build the infrastructure needed to support the church on top of the Vehicle Security Center. As a result of this agreement, the Board approved an $88.6 million contract with the joint venture of E.E. Cruz & Co. and Nicholson, LLC for construction of the walls of the South Bathtub south of the existing World Trade Center site, which will be used ultimately to house the vehicle screening facility and parking for approximately 28 tour buses. The new South Bathtub will be bounded by Liberty, Greenwich, Cedar and West streets. 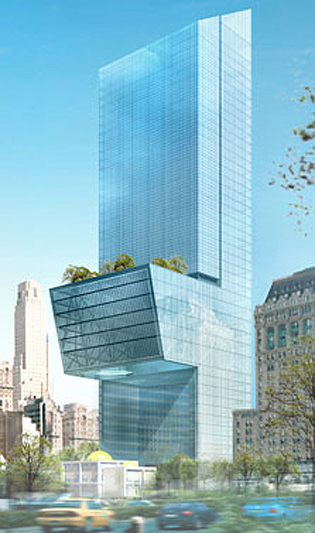 Port Authority Chairman Anthony R. Coscia said, "This agreement with the Greek Church brings to a successful close months of negotiations on an issue that, left unresolved, would have affected the successful construction progress we've made in the past two years and the future work we need to do at the World Trade Center site. It represents the Port Authority's firm resolve to do what is necessary to advance the rebuilding process as quickly as possible." Port Authority Executive Director Chris Ward said, "Resolving this lynchpin issue in a matter of weeks is a concrete example of the new way of doing business at the World Trade Center site. Much more remains to be done, but this agreement represents an important step forward." The St. Nicholas Church land rights claim was one of 15 key issues outlined in the World Trade Center Assessment report, which was commissioned by New York Governor David A. Paterson and released publicly on June 30. The site has been cleared and they have begun to mobilize. Step One: begin construction of the new south slurry wall. Step Two: construct a new Liberty St. pedestrian bridge extension where the stairs come down on the west side of 90 West. St. so they can dismantle the walkway that cuts through the site. It's amazing how THAT footbridge din't get destroyed on 09-11, but the other one did! Archbishop Demetrios celebrating the Feast of St. Nicholas, the patron of the Greek Orthodox church in Lower Manhattan. In the Greek Orthodox tradition, St. Nicholas is the protector of merchants and sailors, children and travelers. But for the last seven years, members of St. Nicholas Greek Orthodox Church in Lower Manhattan have also looked to their parish’s namesake for something else: patience. The members have been without a church since Sept. 11, 2001, when it was crushed in the collapse of the south tower of the World Trade Center. Efforts to rebuild have been delayed by the same byzantine negotiations and bureaucratic complexities that have plagued the entire $16 billion reconstruction of the trade center site. Many of the 100 families who make up the congregation have been worshiping at a parish in Brooklyn, except once a year when they return to the site of their old church — or as close to the site as they can get — to celebrate the day on the liturgical calendar that honors St. Nicholas. This year, that day fell on Saturday. And once again the members gathered inside a heated white tent at the southern edge of the ground zero construction zone. That hint of hope stems from an announcement made in July by the Port Authority of New York and New Jersey, the owner of the trade center site, which said it had reached a tentative agreement with the church that would help it begin to rebuild. The deal calls for the authority to give the church $20 million to build at the northwest corner of Greenwich and Liberty Streets a larger church and a nondenominational hall for visitors to ground zero. But nearly six months later, the agreement has yet to be finalized. “Nothing has been signed,” said Peter Drakoulias, an executive board member of the church. Part of the delay stems from the complicated, interwoven nature of the deal. The new church is to be built atop an underground security screening center for vehicles entering the trade center. The Port Authority has promised to pay up to $40 million to build a blast-proof platform and foundation upon which the church will be built and that must be completed before the church can begin its own construction. Demolition of the problem-plagued Deutsche Bank building also has to be completed before work on the screening center begins. That was delayed when a fire broke out in the building in the summer of 2007, killing two firefighters. Mr. Drakoulias said negotiations with the Port Authority had been congenial, but had taken longer than anyone expected. Chris Ward, the Port Authority’s executive director, agreed. Even when the deal is finalized, parish members know it could be several more years before they once again step into a church they can call their own. The church will also have to raise several more million dollars to pay for the estimated $30 million cost of construction. But for many, the tentative deal was an important step in ensuring that the new church will be in nearly the same spot as the original. They should have gotten that article out sooner, the deal is signed now Im sure we heard recently. THe article was printed because of the meeting yesterday. How quick do you want it. I don't know if he made this statement yesterday or not. I was mistaken, the article I thought was new in post 37 was actually from July. If the article had been new then yeah I would have wanted it released before that announcement. It just dawned on me while looking over the stale KPF rendering for 5WTC, that the new design of the church was there all along.